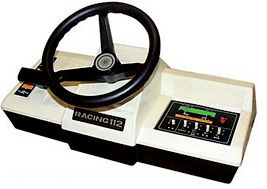 A simple driving game controlled with either the large steering wheel on the base unit for 1-player games, or two smaller wired controllers for 2-player games. You control a car from a bird-eye view, and must avoid the other cars on the road. By changing the various switches on the system, it was possible to play up to 112 variants of the game. Many of these involve changing the movements of the other cars or the size of the road. Famously, the system's hardware was designed by Shigeru Miyamoto, one of his first jobs working at Nintendo as a junior employee.